Facebook has removed over 600 pages and accounts that were linked to individuals associated with the Congress party’s IT cell, in a crackdown on what it calls coordinated inauthentic behaviour in the run-up to the Lok Sabha elections. The social media giant has also removed 15 Facebook pages, groups and accounts that were linked to individuals associated with an Indian IT firm called ‘Silver Touch’. Silver Touch, an Ahmedabad-based company, is best known for its alleged connections to Facebook page called ‘India Eye’ and for having worked for the Gujarat state government and various Central government departments. Various analyses of Silver Touch and India Eye over the last year have shown it disseminating content that is pro-Bharatiya Janata Party. In a statement, Facebook noted that these accounts and pages were removed because their content violated any company policy but because they used fake accounts to share information. We are constantly working to detect and stop coordinated inauthentic behavior because we don’t want our services to be used to manipulate people. We’re taking down these pages and accounts based on their behavior, not the content they posted. The accounts and pages that were taken down had a reach of over 200,000 and had spent nearly $40,000 for running advertisements, the most recent of which ran in March 2019. 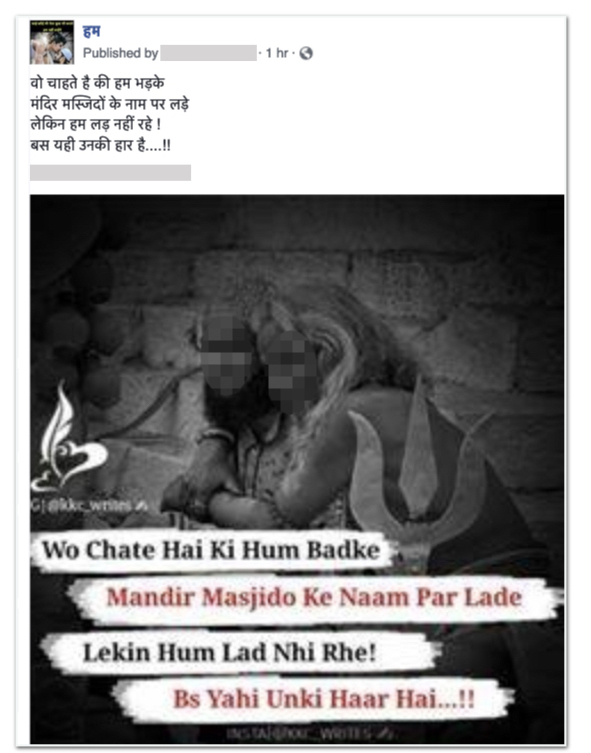 An example of Congress content that was removed by Facebook. The caption reads: They want us to get angry / Fight in the name of temple mosques / But we are not fighting! / That’s just their defeat…!! In an interaction with reporters, Facebook’s cybersecurity policy head Nathaniel Gleicher said that the company had reached out to the Congress to educate them about what we have seen. When we remove one of these networks, the reason we remove them is because of their coordinated inauthentic behaviour, that they are using network of fake accounts to conceal their identity….to mislead who’s behind them. That’s the basic reason for removal,” Gleicher said. 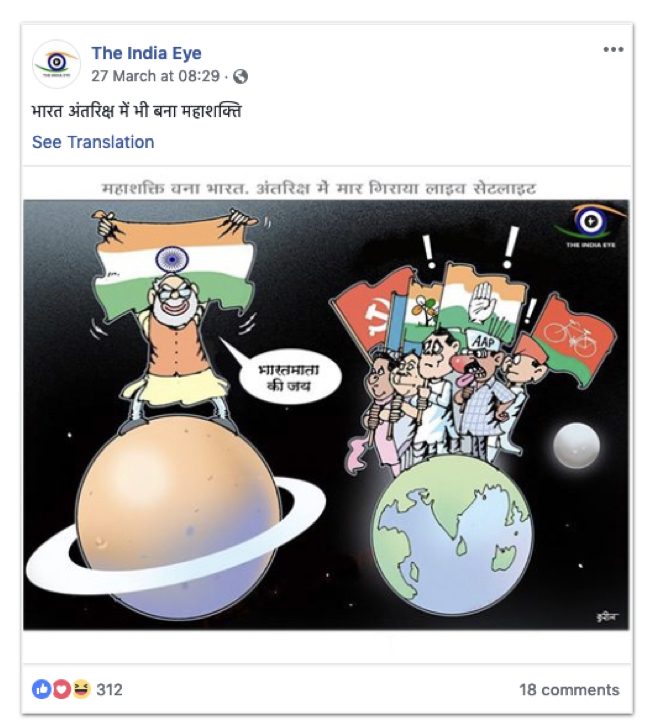 An example of the content linked to Silver Touch, praising the Modi govt’s recent satellite developments, that was removed by Facebook. The caption reads: India has become super power in space also. India has blown up a live satellite in space.” Speech Bubble: Hail Mother India! Silver Touch-linked individuals had a reach of over 2.6 million accounts on one page, and spent around $70,000 in advertisements, the most recent of which ran on February 2019.